West Papuans demonstrating in The Hague. Photo by Apdency, Wikimedia Commons. Sometimes, a view of the future can only be presented in the form of fiction, even though it represents a viable hypothesis of where events are leading. It is, in effect, strategic gaming. It was certainly the case with Stefan Possony’s great book Waking Up The Giant (1974), which discussed how a US president takes office during the Cold War. Australian-born Indonesia specialist Kerry Collison — a fluent Bahasa Indonesia speaker1 — has been forced to specialize in such a genre, largely because legal constraints in Indonesia preclude discussing many political issues. Nonetheless, his writings invariably serve as prescient view of present and emerging trends. His latest book, Rockefeller & The Demise of Ibu Pertiwi, is particularly profound. And Mr Collison surely pushes the boundary of the Indonesian legal system merely for its title, because it talks of “the demise of Ibu Pertiwi”: Ibu Pertiwi is the Indonesian motherland (literally “Mother Earth” from the pre-Muslim, Hindu era of Java). His book immediately immerses the reader into the context of the post-World War II era and through to the transition from Pres. Sukarno into the era of Pres. Suharto, in the 1960s. Suddenly the attitudes and activities of the powers of the day — the declining Dutch and British, the increasingly concerned Australians, and the growing needs of the US — can be seen ensuring the inevitable global acceptance of the fatal “Act of Free Choice” (which was anything but) in July 1969. This was the act which breathtakingly stole the Melanesian, former Dutch colony of West Papua (Irian Jaya), transforming it into a colony of the Javanese-dominated Indonesian Government. It remained a colony, disguised as the 26th province of Indonesia, later divided into two provinces (West Papua and Papua). Collison’s deep knowledge and research will have readers reaching for history books and atlases. But he has been there as this history was being made, and his writing looks for all the world as though it is the combination of diaries of the players in all the camps: Indonesian, American, Australian, Dutch, British, and even those in the village huts in the highlands. The fact that this is “current historical fiction” — a new genre? — does not make the book any less readable or gripping as Collison weaves highly credible scenarios in the halls of power in Jakarta, Canberra, Washington, and London. Indeed, the professional Asia hand will certainly crave even more detail, and I challenge any serious reader not to rush off to consult further references to read of the affairs which have plagued the lives of Papuans for decades. When Collison also weaves into the story the saga of the 1961 disappearance in the Arafura Sea, off southern West Papua, of explorer Michael Rockfeller, scion of the wealthy and political US Rockefeller clan, he does so in a way which adds real credibility to the overall tale. The fact that this makes the book more appealing to US readers is a bonus. Kerry Collison makes it clear that the central player in the economy of Indonesian-occupied Papua is the mining operation which, in Rockefeller & The Demise of Ibu Pertiwi, is the fictitious P.T. Akumuga Mining corporation, run by the also-fictitious Summit Gold Mining Company of the US. The book details the maneuvering and corruption of Indonesian political, military, and corporate interests to seize the mining operation, which has already been central to the Indonesian economy. Collison’s book was already at press when the real-life parallel occurred: On September 20, 2017, the Government selected State-owned aluminum firm PT Indonesia Asahan Aluminium (Inalum) to acquire 51 percent of shares in gold and copper miner PT Freeport Indonesia from the US Freeport McMoRan Inc. parent company of Freeport Indonesia, which runs the mine which is central to the region’s economy. 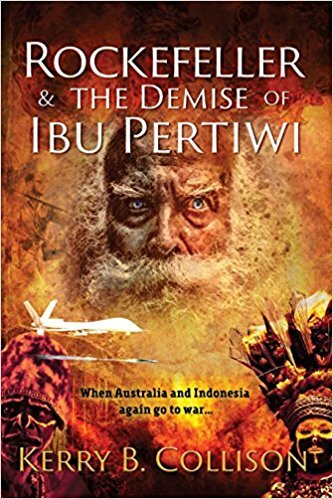 The book is sub-titled “When Australia and Indonesia Again Go to War …”, and not without reason. The issue of Indonesian-occupied Papua is extremely sensitive in Canberra-Jakarta relations, and Indonesian officials still burn over the perceived Australian betrayal in supporting the independence movement in the then-Indonesia-occupied former Portuguese colony of East Timor, now Timor Leste, in 1999-2000. Today, West Papuan independence activists find safe-haven in Australia and, particularly, New Zealand. Collison, in the book, gives significant background to real activities, events, people and organizations, including, of course, the Organisasi Papua Merdeka (Free Papua Movement: OPM) and the very real, multinational body, the Melanesian Spearhead Group. On September 26, 2017, a secretly-gathered petition signed by 1.8-million Papuans, demanding a new independence referendum for Indonesian-occupied Papua, was presented to the United Nations; that represented more than 70 percent of the province’s population. United Liberation Movement for West Papua spokesman Benny Wenda told the Australian Broadcasting Corporation that signing the petition was a “dangerous act” for West Papuans, with, he said, 57 people arrested for supporting the petition, and 54 tortured by Indonesian security forces during the campaign. The Prime Minister of Solomon Islands, Manasseh Sogavare, said the petition was incredibly important and the people of West Papua had effectively already voted to demand their self-determination. Australian Foreign Minister Julie Bishop said that Australia had long recognized Indonesian sovereignty over the Papuan provinces. Kerry Collison’s “fictional” book is essential reading for anyone wishing to understand the unfolding issue of West Papuan independence. *Gregory Copley, AM, GCHT, FRCGS, is the editor of Defense & Foreign Affairs Strategic Policy, where this article was published. 1. Kerry Collison also serves as Indonesia correspondent for the Defense & Foreign Affairs publications. See his recent report, “The Question of West Papuan Independence”, which was published by Defense & Foreign Affairs Strategic Policy, 9-2017.